A children's book that languished in obscurity for five years has become a late-blooming bestseller thanks to being featured in a popular TV series. "The Miraculous Journey of Edward Tulane" by Kate DiCamillo sold 100,000 copies in just one month here since it made an appearance on SBS show "My Love from the Star" on Jan. 1. In the episode, lead actor Kim Soo-hyun was seen reading the book, immediately propelling it to the top of the bestseller lists in major bookstores afterwards. Park Ji-eun, editor in chief at Biryongso, the publisher of the Korean translation, on Sunday said sales of the book surpassed 100,000 during the lunar New Year's holidays. Another remarkable thing is that 18 percent of the sales of this book in January at leading online bookstore Yes24 came through the mobile site, nearly twice the 11.5 percent average of other books. The percentage shot up to 30 percent between 10 and 11 p.m., the time when "My Love from the Star" airs. It seems that many people spontaneously bought the book on their smartphone while watching TV. The book tells the story of a cold porcelain rabbit named Edward Tulane who discovers the meaning of true love. The theme echoes the series, which is a fantasy romance between an actress and an alien. DiCamillo is a two-time winner of the Newbery Medal, a top prize for children's literature. 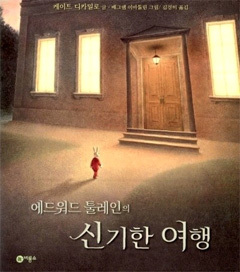 "Edward Tulane" was first published in Korean in 2009 but it failed to appeal to readers here. The sudden craze was led by women in their 30s and 40s, with women making up 72 percent of customers. Critic Han Mi-hwa said, "It's a pity that it's so difficult to draw attention to books without the help of TV or films, because they're much more subtle in depicting emotions and characters, and they still deserve attention in a culture dominated by visual media."